Make a donation to Lake Merritt Rowing Club Today! Your donation to LMRC can directly support programs that expand opportunities for club members and the greater community as well as assisting the club in purchasing equipment and newer boats that would improve the competitiveness of our teams and the pleasure we all share in rowing. 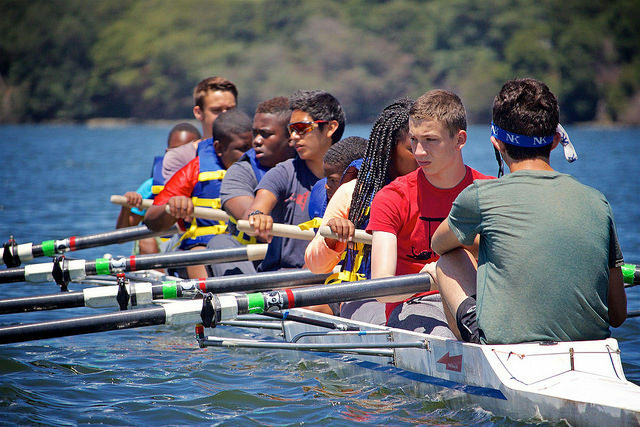 Donations to LMRC’s youth rowing programs bring the great sport of rowing to Easy Bay middle school and high school students. Through the generosity of LMRC donors and our community partners, scholarships are made available for community young people who may not have otherwise had the opportunity to try this rewarding and challenging team sport. Donations will directly augment the club’s purchasing budget and allow our Equipment Committee to accelerate the replacement of our aging boats and equipment. Donations offer financial aid to needy competitive rowers to help defray some of the expenses of traveling to the marquee national and international regattas. For donors of $250 or more, there are opportunities to name a club sweep oar ($250), sculling oars ($350) or a boat ($2000 to $5000). For more information, email the LMRC Board Secretary. We value your help to make LMRC the best rowing club it can be. Though our annual membership fees cover a portion of equipment maintenance/replacement and community outreach, our other expenses - rent, insurance, maintenance, salaries, administration – consume the lion’s share of our dues.